Kris has found a place downtown not far from the Cervantes Parque where we like to go for our veggies and fruit. 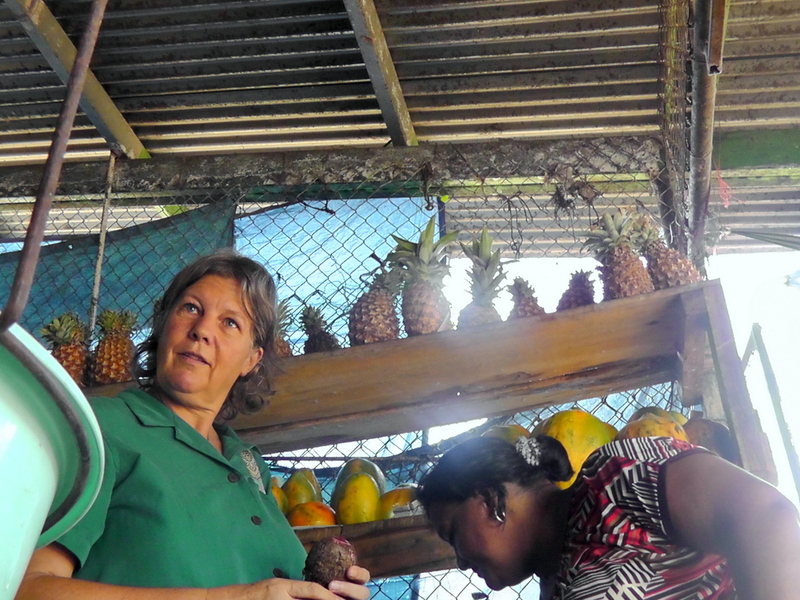 It’s further from our house than the fruit stand near El Rey but the produce and selection is good and we have struck up a friendship with the proprietor. Back in Sarasota, Florida we bought a lot of fresh fruit and vegetables, these here are as good, sometimes MUCH better, and always cheaper. When we got home I put the food on the table after weighing it. As you can see, there is quite a lot of food, it came weighed in at 43 lbs and cost us all of $12.70! The watermelon alone weighed 14 lbs and was 20 cents a pound. 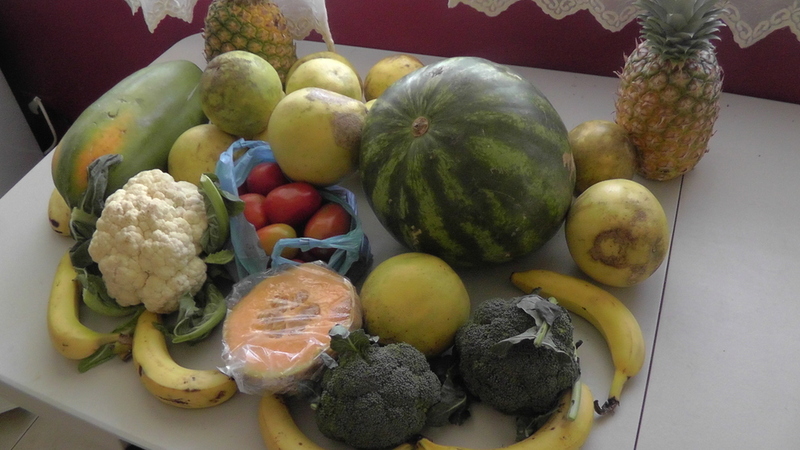 We bought: Papaya, grapefruit, pineapple, watermelon, tomatoes, broccoli, cauliflower, and bananas, The half of a melon was a gift! Lots of good eating here! Great food, great service, great price – what more could we ask for? One more reason for us to love David, Panama! Posted on January 12, 2013 by joeltc1. This entry was posted in Uncategorized and tagged bananas, boomers, cabbage, cheap, Chiriqui Province, David, expat, fruit, Panama, Retiree, veggies. Bookmark the permalink. returning home with beautiful produce is so much fun.. it’s great to admire the lovely colors and wonder which to eat first! We’ve been very happy with the taste and cost of the fruit stand products we get, and the sellers are helpful in picking out the right pina for when you are going to eat it. I NEVER ate pineapple in Sarasota, Florida because it made my mouth tingle too much. I eat pina all the time now with much less tingling sensation and MUCH more sweetness due to the natural ripening that comes when the pineapple is NOT picked early to survive shipping to the US. By the way, we paid $1.40 for two pinas, they were a little smaller than usual so they were .70 rather than the usual price of $1 each. Ma got the melon, we cut into the watermelon first! The fruit and veggies looks so natural… and free of chemical ripening. Are they? I keep saying that farmers in the caribbean especially the banana ones in the organisation of eastern caribbean states (OECS) whohave suffered under WTO rules should produce and promote chemical-free produce. I’m not sure they realize they are doing anything remarkable here. It’s what they have always done. Funny, around here you have to pay a lot more for the imported stuff that probably has chemicals. But, this food for export, you have a point. One would think there would be a good market for chemical free good quality food. But, then you can’t ripen it in the field and all the other concerns that go with shipping things. This is only a test of the “reblog” link at the top of the page. Before this, I have been using the “press this” button below the posts. So, I want to see if this is different or better. It’s definitely easy, but I don’t see how you can add tags and categories like you can when you use the “press this” feature.